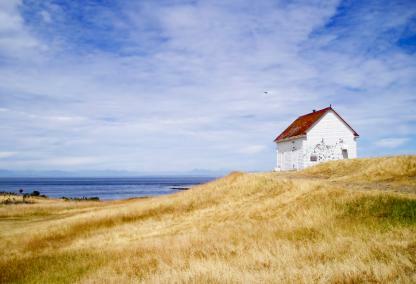 The Gulf Islands are made up of about 200 islands found between Vancouver Island and the mainland. While the most populated and best known of the islands is Salt Spring Island, there is a wide variety of lifestyles and homes available on many of the islands. The larger islands have ferry service, and the smaller islands are accessible by private boat. The sheltered water in between Vancouver Island and the mainland make these islands outstanding sailing, fishing, hiking and boating opportunities. The climate is mild and people often come to recreate and relax. Amenties vary by island with some of the more popular being Denman Island, Gabriola Island, Galiano Island, Hornby Island, Mayne Island, Pender Islands, Salt Spring Island and Saturna Island.